This is the never-before-told story of a true American original. 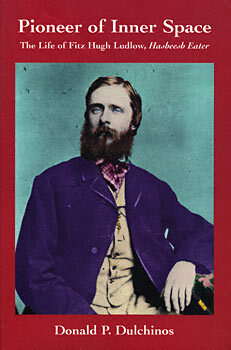 Twenty-one-year-old Fitz Hugh Ludlow became the best-selling author of The Hasheesh Eater in the years before the Civil War. His best-seller related his visionary experiences with large, oral doses of hashish, along with his religious, philosophical and medical reflections on the latered states they produced. He became a celebrated figure in the Bohemian circles of New York City, along with such friends as Walt Whitman. A short-story writer, a drama and music critic and a journalist, he mingled with the high society of New York while dissolutely wandering among the disreputable, hard-drinking literati. Ludlow's journey to the West Coast on the Overland Stagecoach in 1863 was a bold leap into the unknown, and his dispatches to the East were devoured by an eager public. In the company of renowned painter Albert Bierstadt (who later married Ludlow's ex-wife), he talked politics with Mormon leader Brighman Young and traded witticisms with Mark Twain in California, whom he encouraged to seek a wider audience in the East. Ludlow later wrote perhaps the first great novel on the theme of alcohol abuse, and then became a leading expert in the treatment of opium addiction after the Civil War. Fitz Hugh Ludlow is largely unknown today, and his encouragement of mystical experience as mediated by (now-illegal) drugs has been concealed by neglect and fear for over a hundred years. With this book, this pioneer of the Wild West and the landscapes of the mind is finally illuminated as a quintessential American adventurer and man of letters. "Drinking buddy of Whitman and Twain, New York Bohemian of the Sixties (the 1860s, that is), pioneer psychedelic psychonaut and frontier Pythagorean, America's first Hasheesh Eater and confessional junky--this is the definitive biography of our psychic great-grandfather--Fitz Hugh Ludlow." ""The most long-awaited of any 19th-century American biography. Through a wealth of newly discovered data, Dulchinos describes the circumstances that led to the making of the 'American De Quincey'. Fitz Hugh Ludlow has at last found his biographer."